MBLN - Massachusetts Black Librarians Network, Inc.
MBLN – Massachusetts Black Librarians Network, Inc. The Massachusetts Black Librarians Caucus, under the leadership of Patricia Wilson, was organized in the Fall of 1978 as a support group of library professionals and library assistants from diverse backgrounds: academic, public, private and public schools, corporate and other special libraries. On December 6, 1980, a membership tea was held at Simmons College to acquaint prospective members with the history of the Black Caucus of the American Library Association (ALA) and the proposed activities of the Massachusetts Black Librarians Caucus. 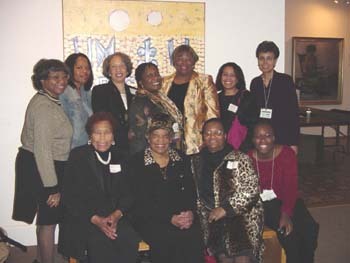 In 1993, the name of the group was changed to the Massachusetts Black Librarians Network (MBLN). MBLN promotes awareness of library services within the African-American community; encourages and supports students who are preparing for the profession, through scholarships and educational meetings; exchanges and shares ideas; presents book festivals and programs by storytellers, authors, academicians, researchers, and other persons of interest. MBLN is an affiliate of the Black Caucus of the American Library Association (BCALA).